Colonial Acres Coins is excited to present their next auction for online bidding. Over 800 lots are up for grabs with opening bids at 50% of trends or less; and all Silver and Gold Bullion opens up for a dollar. Join the live bidding on Sunday November 18th, 2018 at 12:00 PM EST ONLINE ONLY through icollector.com. 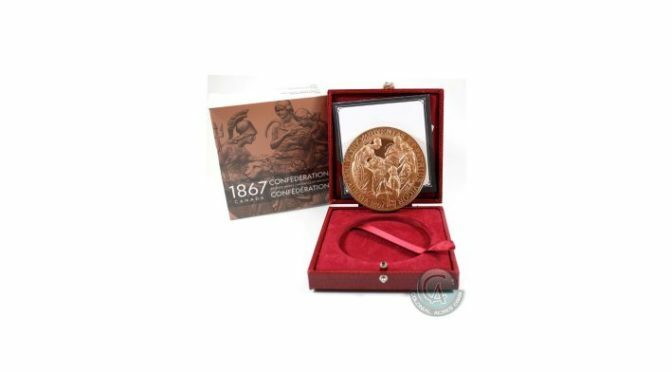 Lot 20 is an early highlight for the collector that offers up an 1867-2017 Confederation Re Strike Bronze Medallion. This is a limited edition restrike of Canada’s 1867 Confederation Medal first issued shortly after Confederation. The Medal has been struck from expertly re-cut dies for Canada’s 150th Anniversary of Confederation. The coin comes with all original mint packaging (outer box has a small tear). It came from a limited mintage of 500. Bidding opens at only 99 dollars. Silver is featured at Lot 53. Colonial Acres is offering a beautiful 2009 Australian 10 oz .999 Fine Silver Kookaburra. This is tax exempt for bidders and opens for a low price and hammers to the highest bidder. There is a beautiful photo of the coin available in the online catalog. Lot 547 is an example of the currency offered up in this auction. An Osborne-Towers Bank of Canada Note from 1935 is selling. It is a $1 note with serial number A3115378 and graded by PMG as AU-58. Bidding opens for $279 dollars. Live and mobile bidding is available and absentee bidding is currently being accepted. The entire catalog is available for online inspection with full photos and descriptions. Colonial Acres is happy to take any phone calls or emails on any of the over 800 offerings going up on the auction block and will provide fantastic pre and post sale service to all bidders and consignors. They have a variety of payment methods including online bill payments through select Canadian institutions.